At Seal Methods, Inc., we provide builders with products designed to seal, insulate, and reduce sound and thermal transmission. Our broad line of compressible foam and adhesive tapes, gaskets, and extruded foam profiles are available in a wide range of densities, thicknesses, and adhesive formulations. These materials are ideal sealing solutions for hundreds of construction applications – such as glass & windows, sill systems, exterior wall systems, and metal walls & roof panels, acoustical systems, roofing, and more. Applied between wood or metal framing members and sub-flooring, exterior sheathing, or interior gypsum board, Norton CST® Construction Gasket utilize a patented technology to reduce sound and thermal transmission. When used on floors, walls, and ceilings, it gives the room a quiet ambiance – it is proven to reduce noise transmission by up to 90%. We offer solid and foam core butyl mastic tapes in a variety of shapes and dimensions to meet the needs of commercial or residential projects. Low density closed cellular Sill-Seal material is designed to seal between the sill plate and masonry or reinforced concrete. By reducing air infiltration, it provides a tighter building envelope and promotes energy savings. This product has excellent resistance to weathering, fungi, and oxidation and is available with an optional pressure sensitive adhesive to speed installation. 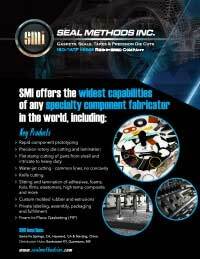 SMI provides virtually any type of pressure sensitive tape for temporary or permanent component attachment. We offer a full line of AAMA-approved glazing tapes for applications such as interior glazing, residential and commercial windows, two- and four-sided structurally glazed curtain walls, and skylight systems. Cellular glazing tapes provide superior long-term sealing, thermal resistance, sound dampening and aesthetics when compared to solid and gunnable materials. Economical options are available for both residential and commercial applications. To facilitate bonding glass and other exterior wall panels to the framing system, we offer Thermal bond® structural spacer tapes. We also offer polycarbonate- and Plexiglas-compatible sealants and adhesives. SMI offers protective shipping and spacer pad materials to glass manufacturers specializing in flat, bent, tempered, insulated, and mirror glass. Custom laminated using cork, vinyl, re-bonded rubber, felt, and various grades of foams, these materials are available with a permanent or repositionable adhesive or a static foam/film. We custom manufacture products with the thicknesses, width, and length dimensions to meet your exact needs. We also offer a full line of protective films, masking products, and setting blocks in any dimensions.